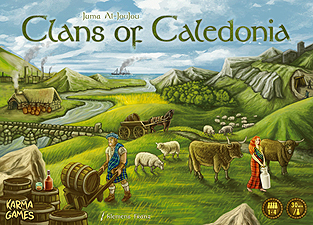 Clans of Caledonia is a strategic and interactive economic game set in 19th-century Scotland. During this period, Scotland made the transition from a predominantly agricultural economy to an industrialised one, heavily reliant on trade and export. Food production increased to support the growth in population, cheap cotton imports increasingly replaced linen, and raising sheep gained importance. Also, whisky turned into the premium alcoholic beverage in Europe! As proud members of the old clans you use your unique abilities to earn the greatest wealth and fame. Features such as a modular map, nine historic clans, and various scoring and port tiles provide you with outstanding replayability.